Am I the last person on earth to know about mug cake? Apparently if you google it you will get 100 million results, so maybe I am. But I know three other people who had no idea what it was: the childhood friends I spent the weekend with. After eating a (somewhat) healthy dinner, we had the urge for a sweet, as people do. It turns out I had the front section of the New York Times with me and next to the mini crossword puzzle (I love that thing!) there was a recipe for chocolate mug cake. All you need is a mug and a microwave and a few ingredients you probably have on hand. I made 4 of them in a row. That’s because the batter is mixed and nuked right in the mug. Okay, I can hear you rolling your eyes out there — I’ve never used my microwave for cooking either. And I’m not sure I would even call this cooking, but whatever it is, the result is amazing. The Times recipe was too sweet and too dense though, so I dialed back on the sugar and cocoa and tried it a few more times. What I got was light and barely cakey, more like a chocolate soufflé. 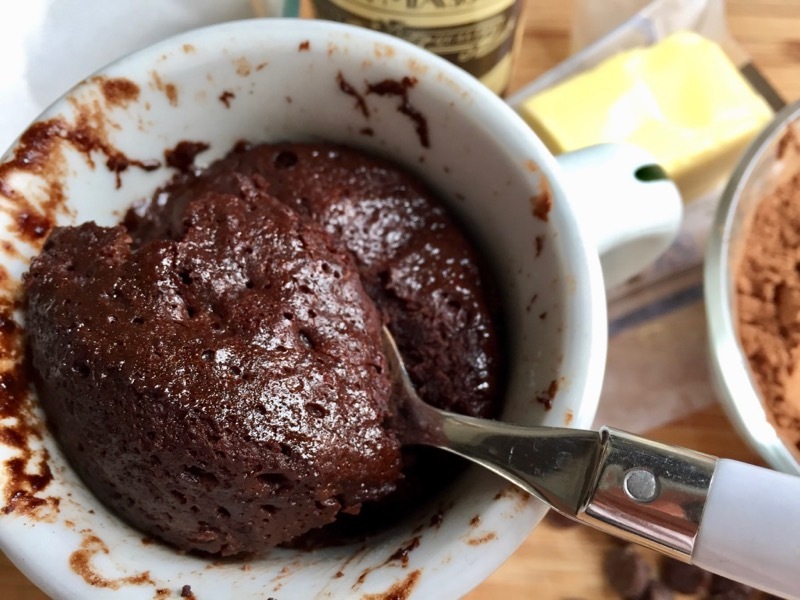 So I’m calling this chocolate mug souffle, which only gets 765,000 Google results. Note: this fits perfectly in a diner mug, one with a 6-ounce capacity. But you can use any microwave-safe mug. If it’s larger, there will be room to put a scoop of vanilla ice cream on top (I’m looking at you, Brita). Put butter in a microwave-safe mug and microwave for 30 seconds on high power. Swirl mug a bit to grease the sides with the melted butter. Crack in the egg and a few drops of vanilla; whisk with a fork until blended. Add the cocoa powder and sugar and whisk with the fork until well combined. The mug will get messy inside, so scrape as much batter down with a rubber spatula as possible. Sprinkle a teaspoon or so of chocolate chips on top for extra gooeyness. Microwave 1 minute on high power and serve warm, with a scoop of ice cream on top if there’s room.